Punt THIS! | We are small. We are smart. And we have had enough. We are small. We are smart. And we have had enough. This post is overdue. And for that, I apologize. Sometime in the first week of March, the guild <Punt This> was destroyed. The guild bank was taken, but more importantly, the guild bond which brought the Lillis together was taken away. At that time, guild leaders needed to log in to the GM character every 30 days or else they would be dethroned, with the rank becoming available to any character of nearby rank. In the case of <Punt This>, with its extremely flat hierarchy, this meant that any of some 125 Lilli characters were eligible for the job. 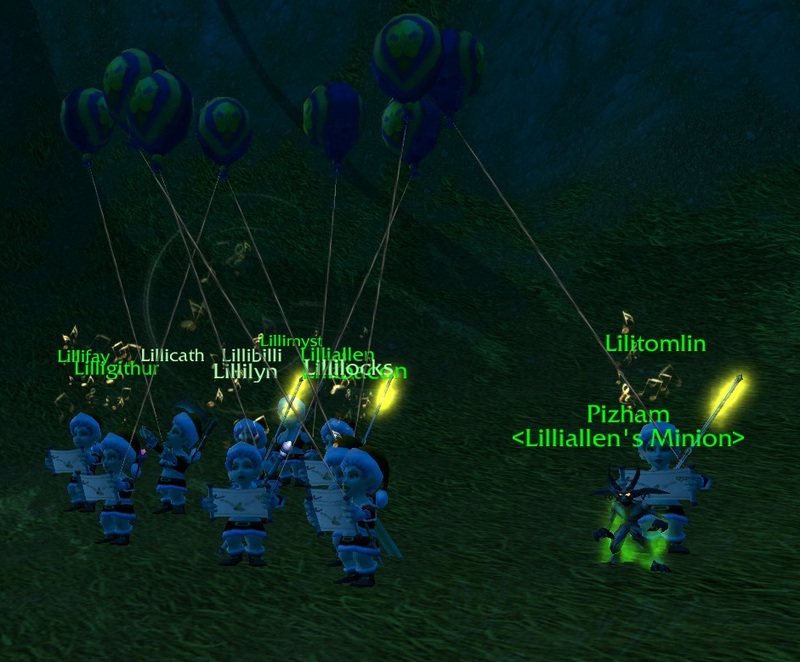 One of the Lillis assumed control, transferred the guild off server, and took the guild bank with them. I was devastated by this betrayal. Blizzard confirmed for me that the guild had been transferred, but could not disclose the identity of the thief. I spent those first few days scanning a lot of auction houses, looking for the characteristic +22 Intellect enchant which made up the bulk of the <Punt This> guild bank. But nothing came up. February had already been a tough month for me with WoW; I was barely logging in at all to any of my characters, let alone my Lilli. 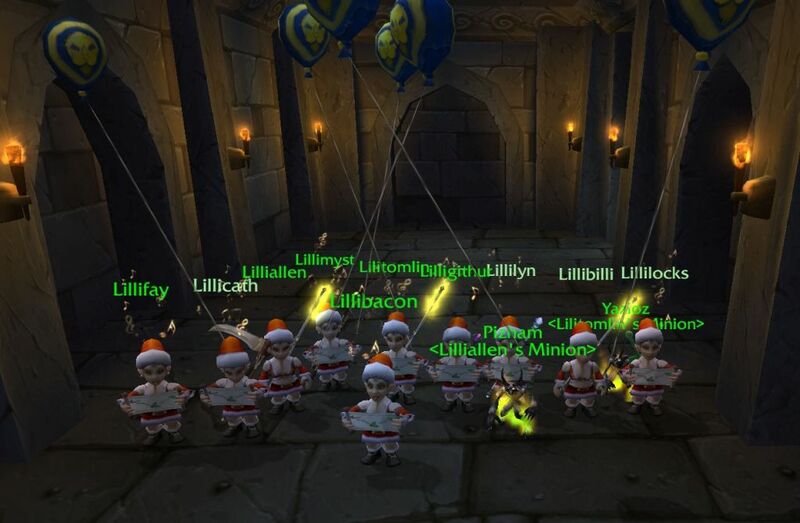 Many of my friends had stopped playing, and Amicus Fidelis – the host guild on Durotan – was going on a raiding hiatus. I offer this not as an excuse, but as an explanation for why the dethroning happened. But I can’t explain why a Lilli would sell out other people’s enjoyment for a few thousand gold. I don’t think I’ve every laughed harder at people’s antics in a video game than I did with the Lillis. 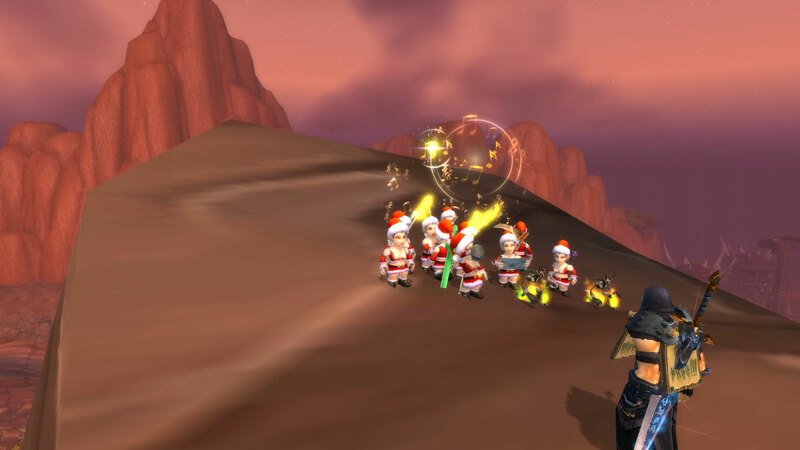 These little pint-sized clones brought a lot of joy into a game that doesn’t always have it. They – you – brought a dose of silliness and mayhem and a spark of life to WoW. That someone saw fit to snap the bonds which brought people together to have fun – silly, zany, madcap fun – really upset me. Perhaps I should have known better and trusted less, limited invites, vetted applicants, asked for blood samples to power the Clone-o-tron 5000. But doing so would have been against the point of <Punt This>. I didn’t want to talk about it at the time, even though I should have. And for that I am sorry. It hurt too much.I can say that now, but I couldn’t say it back then. We’d built a little haven from the grimness of Warcraft and it was ours, and someone took it from us. And worst of all, I let them. It was my mistake, and I am really, truly, sorry for it. I wanted to thank all the Lillis for helping to build something ephemeral and wonderful. 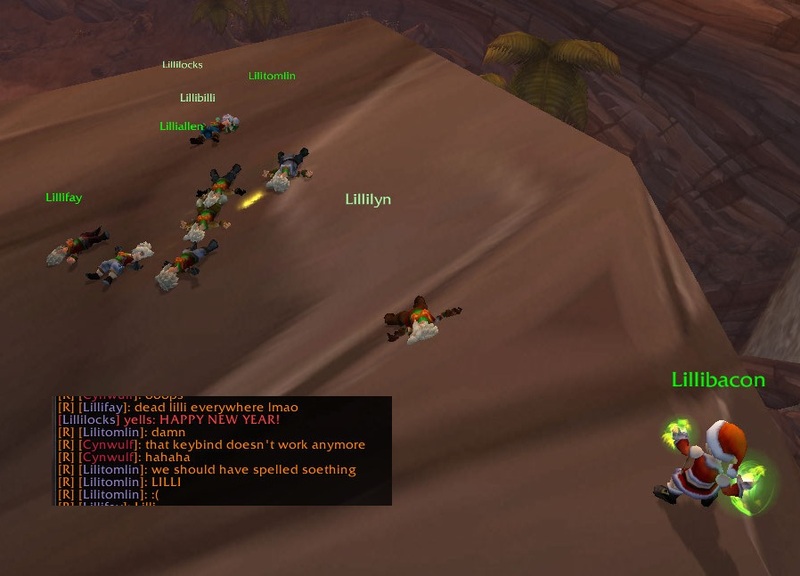 Everyone pitched in to help, be it gathering mats or helping to write articles or even just leveling a Lilli. It was an amazing time, an amazing thing to witness. Thank you. If someone else wants to pick up this torch and carry it, please – do so. No Lilli is irreplaceable, not even this one. Special thanks need to be given to Psynister, Fynralyl, and Narci for providing a massive underpinning of support on Durotan for this endeavor, and for Alas the crucial driving force behind <Punt This>. I’m sorry it ended this way, but I’m glad to have shared these memories with you all. 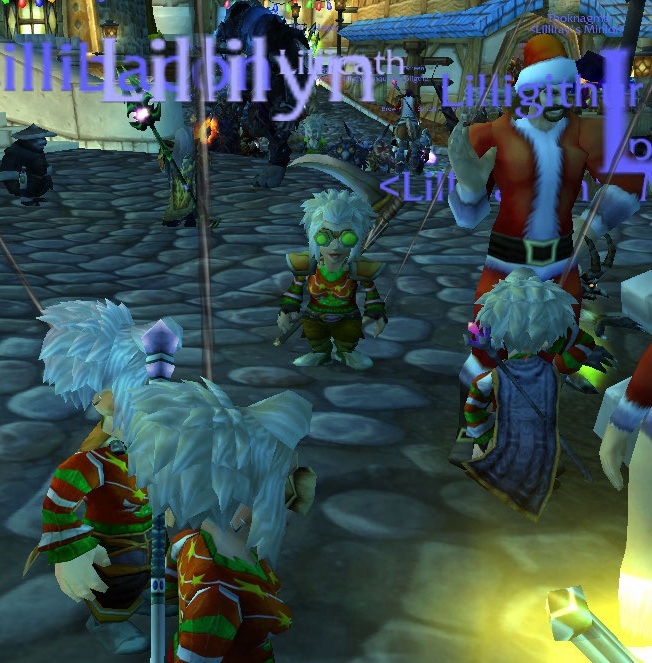 I, for one, will miss all us crazy white pineapple-haired gnomes. … and excellent fashion choices. 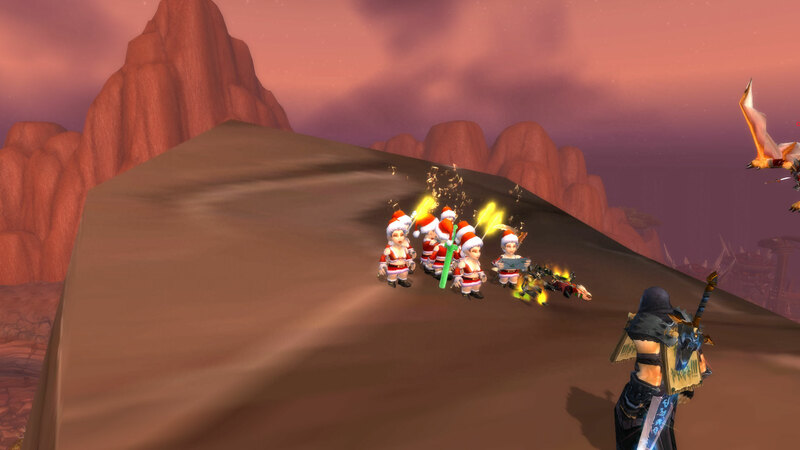 While waiting for the sacrificial summons to be moved into position, <Punt This> amused themselves on New Year’s Eve in grand gnomish clonish tradition, by getting smashed, putting on their holiday outfits, and taking a dip in the local hot tub. It wasn’t hot until the Lillis got in it. There may have been some behavior that the tall ones would consider “inappropriate,” but the local populace did not seem to mind. 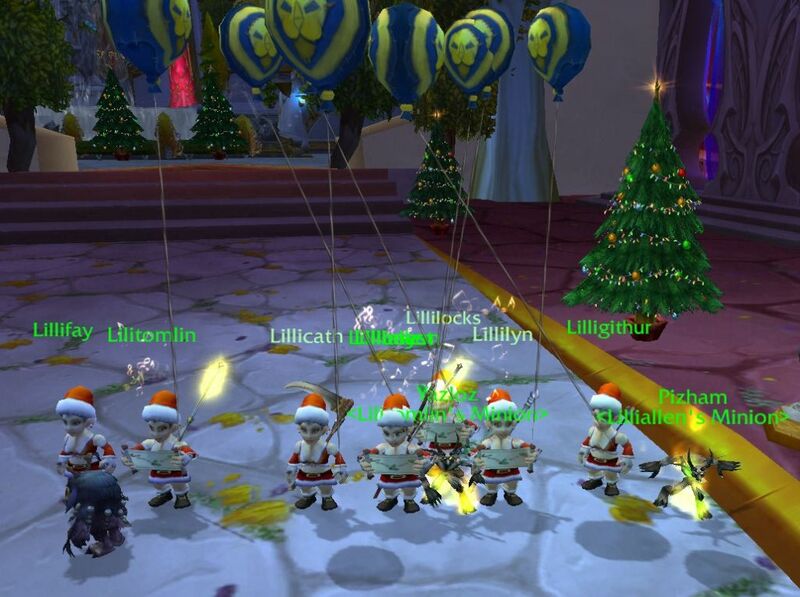 Once all were assembled and in place, we began our journey to bring holiday joy and good spirits to the Horde capitals! 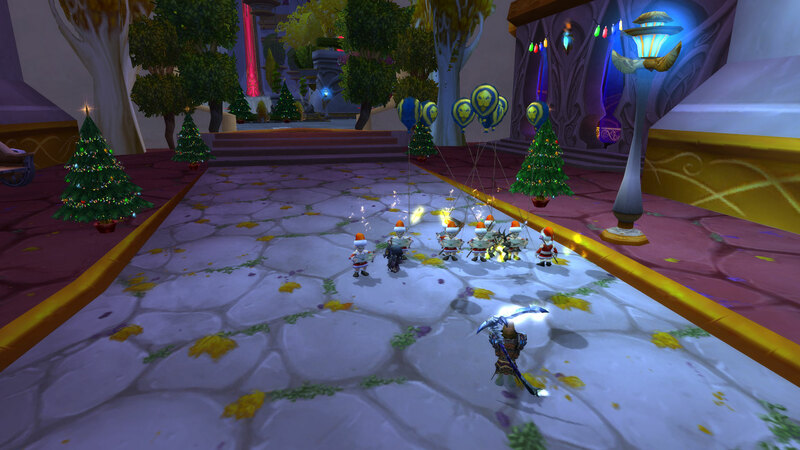 It may or may not be true that the local constabulary were called in for a group of gnomes disturbing the peace. If true, it is entirely coincidental. 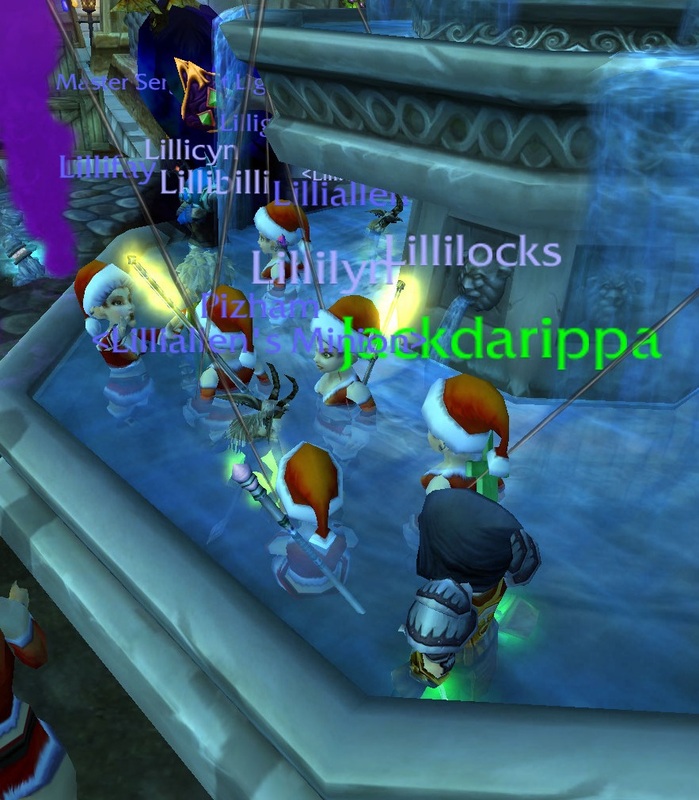 The blood elves of Silvermoon City were most appreciative of our caroling. Their Arcane Patrollers, however, were less impressed, so we moved on quickly, despite applause from our fine elven hosts. The smell, however, was pretty bad. Not going to lie, having enhanced senses (as all Lillis do, thanks Clone-o-matic 5000) sometimes has drawbacks. 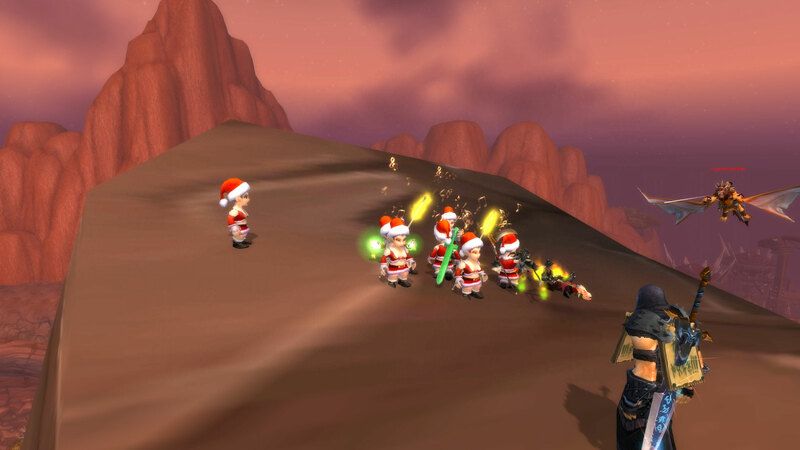 Based on our last excursion to Thunder Bluff, we decided to spend some time exploring the base of the bluffs, to allow our angelic voices to carry up to the celebrating Horde. We may have also planted explosives. You can’t prove anything. Finally, to the home of the orcs! 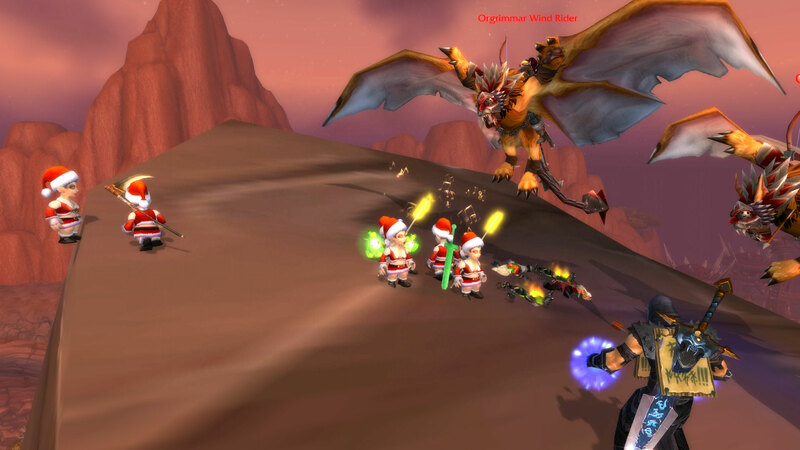 Perched high atop one of the rocks of Durotar, we sang our holiday songs, bringing in the new year and wishing all the best to our enemies. No, really! We meant the best. Much fun was had by all. 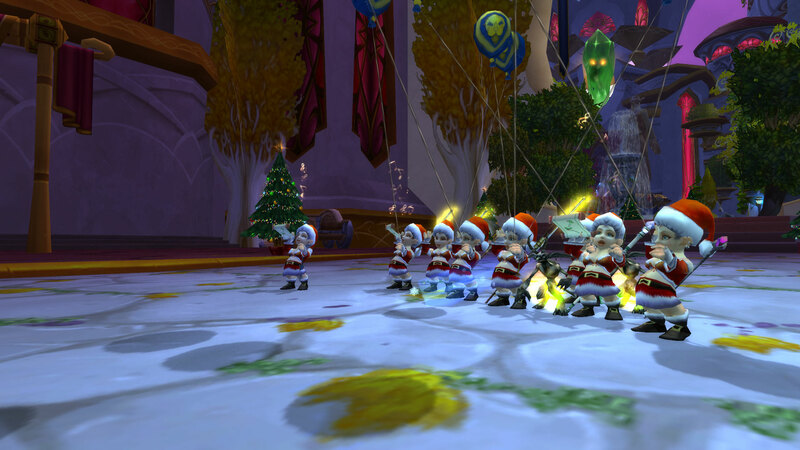 Many thanks to everyone who was able to attend our New Year’s Eve celebration, and thanks to @lordkaladar and @zaralynda for taking such awesome screenshots! Who’s up for a Lilli holiday carol this New Year’s Eve? @Litedoctor suggested that we go festively caroling through the cities of Azeroth wearing Gaudy Winter Veil Sweaters, visiting both the Horde and Alliance capitals, singing and dancing and drinking in the new year. Perhaps we will even pick up A-Caroling We Will Go! A lot of people have plans for New Year’s Eve, so let me just ask – if we did this around 9-10 PM EST tomorrow, would you be able to attend? Let your fellow Lillis know if you can! Update 12/31: Looks like 10 might be a better time for more folks? As I’m sure you’re aware by now, the new Darkmoon Faire is in town for the week. 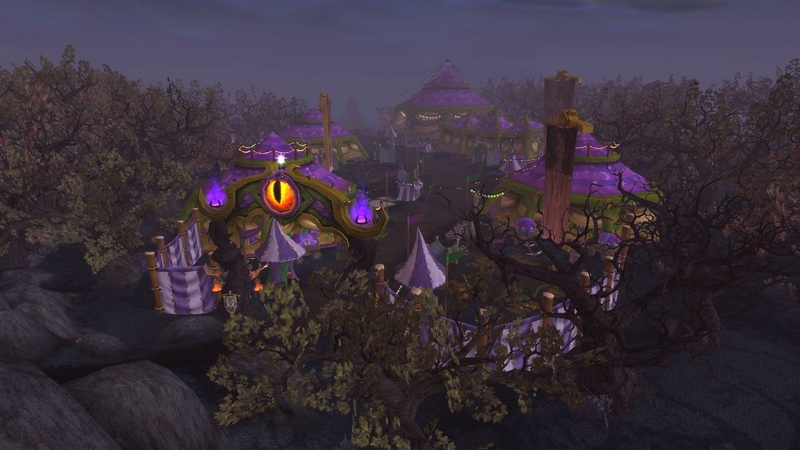 The Darkmoon Faire offers all kinds of fun little games to play, achievements to…achieve, and quests to complete. And of course, it brings along the focus of this entire expansion – yet another grind. This grind doesn’t get you any end game gear though. Instead if provides a nice collection of pets (6), mounts (2), toys, PvE heirlooms, and gear from the past for all your transmogrification needs. 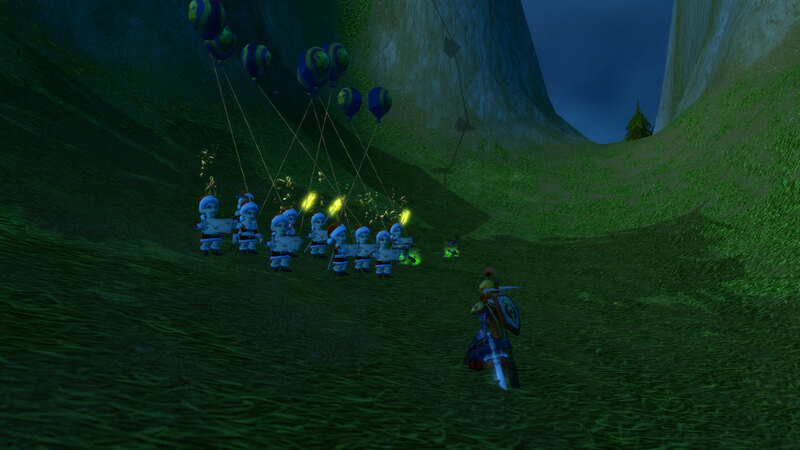 Basically, this is Cataclysm’s version of the Argent Tournament. The major difference is that the DMF is only around on the first week of every month, starting on the first Sunday of the month. The purpose of this particular post is farming for those heirlooms. Why? Because heirlooms are kinda “my thang”. You feel me? You know what I’m sayin’? You smell what I’m stepping in? Alright, let’s get to it then. At the end of the article I have a summary of how many tickets it’s possible for you to farm so that you know what kind of schedule you’re looking at regardless of what items you’re farming for. I wanted to include this in the guide with the F2P community and the Gnome Clones in mind, though I’m sure some of you other players might like the heads up as well. The regular daily quests are reportedly able to be done by a character of any level. I’ve heard people say you have to be level 10, other say there’s no level requirement. We have confirmed that you can start the DMF daily quests at level 1. You need to be level 6 to accept the quest that sends you there, but that quest has nothing to do with getting in or doing anything. In order to do the professions quests, which can be done only once per Faire, you have to be the minimum level to have the profession (which is 1 for non-crafting professions, 5 for crafting). You also have to have a skill rank of 75 in order to open the quests. For the Darkmoon Artifacts to drop for you in dungeons and battlegrounds you have to be at least level 15. Dungeon artifacts drop primarily from the final bosses in the dungeons though some are able to drop from others. The first artifact that I got was on the second boss in one of the new heroics, and all of the others have come from final bosses so far. Battleground artifacts come from the corpses of your opponents, so make sure you’re looting those insignia. Also, dungeon artifacts come up in the Need/Greed rolls while for battlegrounds to the looter go the spoils. Archeology is the exception to the professions rule since it has a level requirement of 20. It also requires to you have a skill level of 75 and the quest itself requires you to have 15 Fossil Fragments to complete the quest. So not only do you have to have this profession, you also have to have spent the time leveling it and collecting specific fragments in order to do the quest. So the minimum level I would suggest for seriously farming the Prize Tickets is level 15 since you have access to almost everything. Level 20 opens up one more monthly professions quest (Archeology) and then you’ve got access to all but the two artifacts that require you to be level 85. However, you can start this farming at level 1, so there’s no reason to wait if you have a fresh toon and the faire is in progress. Through further research I have found that the A Treatise on Strategy artifact requires level 85 and so far all reports show that it drops only from level 85 Heroics, and typically from bosses whose names reveal them to be somehow related to a military calling such as Commander Ulthok, General Umbriss, and Admiral Ripsnarl. Also, the artifact called Soothsayer’s Runes requires level 85 as well and is confirmed to drop in Tier 11+ raids. This one is unique then in two ways. First, that it’s the only one dropped in a raid rather than a dungeon. Second, that this one does not require a loot roll; instead, everyone in the raid who has a copy of the Darkmoon Adventurer’s Guide in their inventory will receive it when it drops and is looted. Before we get into how you go about farming these things, it’s important to know how much farming you’ll have to do. Of the 25 PvE heirlooms that you can get from the Darkmoon Faire, 19 of them (chests, shoulders, one-handed weapons) require 110 Prize Tickets, the two trinkets both require 130 Tickets, and the two-handed weapons require 160 Tickets. You cannot get heirloom cloaks or helms from the Faire, and no new item slots were opened in this patch so legs and rings are still unavailable all together (save the ring from the Kalu’ak tournament). The good news is, these prize tickets aren’t that hard to get your hands on. The bad news is, the event is only around for the first week of every month which means you have a set window in which to do all of your grinding and your grinding potential is limited by the small number of available quests. Questing is your main source of tickets. There are five daily quests that you can do, and each of those rewards a single ticket. You can do those daily quests eight times throughout the week, for a total weekly farm of 40 Prize Tickets. How do you do daily quests for eight days in a seven day week? You log on at 12 A.M. server time on Saturday night and do the dailies before 3 A.M. server time on Sunday morning when daily quests are reset. There’s your weekly exploit report, now back to our regularly scheduled farming guide. So 1 ticket per quest, 5 quests per day, 7(+1) days per week. Blizzard quotes this as being available only seven times per week, but unless they put something in place to stop it, you can still farm an extra day’s worth of dailies during that three hour stretch each time it opens. Each month, once per Faire, you can do a quest related to each of your professions and secondary skills as long as you have at least skill rank 75 in that profession. Each character can have a total of six of these (two professions, four secondary skills) at one time. Professions reward 4 Tickets each while Secondary Skills reward 3 Tickets each. For most players that’s going to be the final count on this type of farming. However, if you’re all kinds of serious about farming these heirlooms you can actually (ab)use the system here by leveling your primary professions to 75, doing their quests, dropping the professions, picking up 2 new professions, leveling to 75, doing the quests, drop the professions, rinse and repeat for all eleven professions. So crazy people can get a total of 3 tickets per quest, for all 11 professions and all 4 secondary skills, for a total of 45 prize tickets per month. Other monthly quests include the Test Your Strength quest which has you collect 250 Grisly Trophies from targets you kill, and quests that start from all of the Darkmoon Artifacts that you get from dungeon bosses and looting insignia from opposing forces in battlegrounds. There are a total of nine Darkmoon Artifacts: five from dungeons, three from battlegrounds, and 1 from T11+ raids. Each of these artifacts starts a quest which is simply turning the item in at the Faire. I’m awaiting confirmation on whether or not Blizzard has put a stop to the dropping/repicking professions thing I mentioned above. If it’s gone, then 110 Monthly is the limit, while if it’s not you can add another 36 to the total. This is the part of the guide that’s applicable to everyone who wants to farm the prize tickets, even if you have no interest in heirlooms. These are your total farming caps per month for you to determine how long you’ll have to farm to get all the items you want. So in the first week you’re able to farm a maximum of 158 Tickets if you’re sane, or 185 Tickets if you’re no longer restricted to the realm of sanity. This works out to roughly 2 heirlooms every two months unless you’re buying expensive ones in which case it will be one on the second month and then one to three more on the third month, and so on. Some of you have no doubt noticed that there is a problem queueing for the level 24 locked bracket since 4.3 was released – queue times are really high and never seem to pop. This is happening in the locked 19 bracket as well, but eventually those queues are popping. There’s no sign of the 24 bracket popping. Other twinks confirm this on twinkinfo. This is probably a patch-related bug, though other locked queues (the 70s) aren’t acting this way. Blizzard is looking into the matter. With 4.3 bringing the ability for us to transmogrify our gear to look the same, it’s time to step up the gear list. Keep in mind that the point of the Gnome Clones, so far as gear is concerned, is primarily to look the same, so don’t feel like you’re required to go out and farm best in slot gear just because it’s on this list. If you already have your clone gear then you can keep right on wearing what you’ve got. Transmogrification simply allows you to use even better gear while still looking exactly the same. The lists that follow include farmable upgrades for the items that are currently on the gear list as well as the literal best in slot if you’re interested in taking your clone to the furthest reaches of gnome twinking. If you see an item with an asterisk (*) after its name, check the notes below the table before you go rushing off to get one, or you might end up wasting resources on a potential downgrade. The head slot has two options listed because this is one of those times where “upgrade” is a subjective term. The goggles that are on the default Gnome Clone list has +9 Stam, +9 Int, and +9 Spirit making them the best balanced head piece you can get. However, there are two choices that are “upgrades” if you’re looking to maximize a stat rather than staying balanced. The Goggles give you a large Int boost if you want stronger heals/damage, while the Fishing Hat gives you a significant health boost for keeping you alive. You don’t necessarily need to upgrade to either of these items because we have a balance of Int and Stam already. If you’re looking to maximize one or the other, then these are your options. The Spidersilk Drape isn’t necessarily an upgrade compared to the Tumultuous Cloak of the Sorcerer that’s currently listed in the gear list. It trades 1 Int and 4 Haste for 4 Hit. If you find that you need hit, this is your best/easiest alternative. The Mechbuilder’s Overalls are nearly impossible to find. 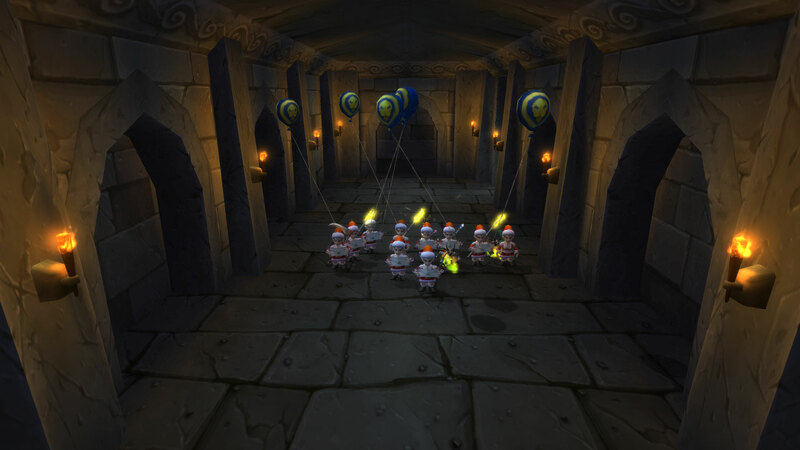 They have a 0.03% chance of dropping from four of the mobs inside Gnomeregan at the very best. The other six mobs that can drop them have a 0.01-0.02% drop rate. The “easiest” way to get these is to farm the Auction House hoping someone sells them who has no clue of their value. On the servers that I actively play on these sell for roughly 7,000g on the AH. Before 24 twinking was a big thing I usually saw them for 350-500g. Now that transmog exists I don’t expect to ever see these going for cheaper than that. Mindthrust Bracers are another subjective upgrade. You lose some Int and Spirit and pick up some Stamina in return. These bracers are hard to find because they’re a zone drop with a max drop rate of 0.11%. However, these did get nerfed in the Shattering so they’re much cheaper on the AH now than they used to be. Pre-Shattering you could find these for 50-75g, these days you’re looking closer to 15-25g. They’re still good bracers, they just aren’t the fantastic bracers they once were. Spidersilk Boots trade 1 Int and 5 Crit for 3 Stam. Some people might consider that an upgrade, and others might not. Whether or not I made the change would depend on my class and spec. As a Mage, I’d keep the Acid Walkers. As a Warlock, I’d only keep Acid Walkers if I were Destro. As a Priest, I would take the Spidersilk’s if I was healing, and I would consider Acid Walkers if I were Shadow. Charged Gear are rings that the final boss of Gnomeregan drops (25%) that have a random enchant on them. There are three particular versions of this ring that you might be interested in: “..of Intellect” (+10 Int), “..of Stamina” (+10 Stam), and “..of the Eagle” (+7 Int, +6 Stam or +6 Int, +7 Stam). You can mix and match these however you want based on your own stat priority. Some people like the idea of +20 Int or +20 Stam from their rings, while others prefer to have +13/14 Int and +14/13 Stamina (the Eagle enchant gives +6 to one and +7 to the other, I don’t believe you can get a +7/+7). Others might even prefer going with +10 Stam on one and +10 Int on the other, or a +10 Int/Stam and a +6 Int, +7 Stam on the other. The great thing is they aren’t unique so you can really customize to your desires, the bad thing is you have absolutely no control over which version of the ring he drops and there are 30 different version of this ring available. Other versions of the Charged Gear you might consider holding onto if you find them are “..of Arcane Resistance” (+17 Arcane Resist), “..of Concentration” (+4 MP5), “..of the Owl” (+6-7 Int, +6-7 Spirit), “..of the Whale” (+6-7 Stam, +6-7 Spirit). All of these can be useful in certain situations. Arcane Resist helps you against Mages and Boomkins while the others are mostly useful for restoring your mana. The Arena Grand Master trinket is basically the trinket of twinks. The problem is, it’s freaking hard to get one of these. 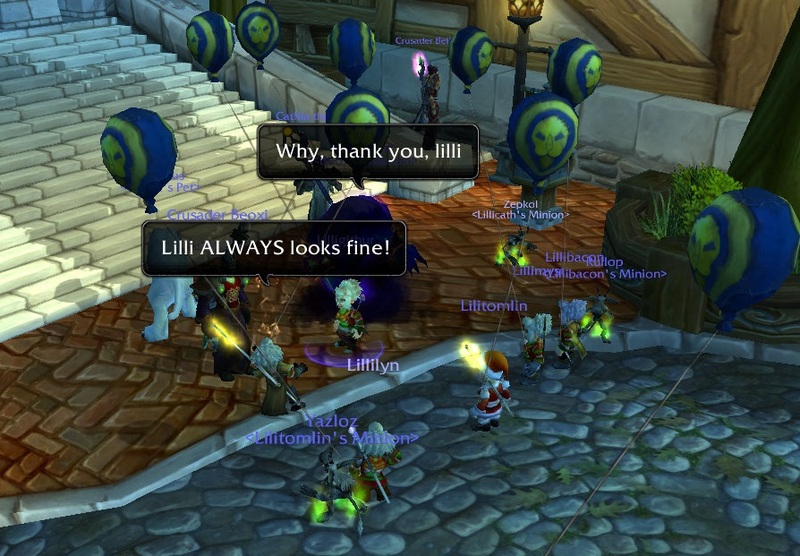 On some servers it’s not a big deal because nobody else ever goes for it, while on others you’re often looking at anywhere from 2-12 level 85 characters camping people who try to get anywhere near it unless you pay them each enough gold to leave you alone or buy their protection. The chest that this trinket comes from shows up every 3 hours on the 3rd hour (3, 6, 9, and 12 o’clock server time) and it’s right in the middle of an arena that auto-flags everyone who enters even against your own faction. If you can get online during off hours, then you might have a chance at farming this on Durotan. You might be able to talk some AF members into helping you now and then if you need some protection, but with 130+ clones needing 12 chests each…this is a trinket to hope for, not one to count on. If you see an item here that has an asterisk (*) after the name or listed as a part of the price or something, be sure to check the notes below the table before you go rushing off to find the item as it could be a potential downgrade or have special requirements to obtain it that you may or may not be able to meet. NOTE: This list only takes into account items obtainable by Alliance characters. True BiS would take both factions into account and require you to faction change as needed in order to get the literal best item for every single slot. I don’t think anybody here is that dedicated to their Gnome Clones, so I’m not going to go that far. If you really, really want me to because you’re obsessed with your Gnome and 24 twinking that much, I will. Maybe. The Tattered Dreadmist Mask is the best helm you can get, though you can’t necessarily get it. If you don’t have a high level character on the server where your Gnome Clone is located, then you won’t be able to get this thing for a loooong time. The only option you have that doesn’t involve leveling or transferring a toon to the clone server is to roll your clone on your home server where you have a guild that can supply this helm and then use RealID with some of the members of your primary clone server. With 4.3 you can now use RID to group with friends and queue for battlegrounds in addition to the dungeons we could already do this with. You miss out on some of the social aspects of being with the other clones, but you can still participate in BG’s and LFG. The Ancient Bloodmoon Cloak is just like the Mask above, except that it only requires a level 10 Guild. It still requires Honored reputation with the guild though, and getting that on a low level character is something that really shouldn’t even be considered unless you’re freaking crazy and you know it. The Dignified Headmaster’s Charge can be purchased by 24 twinks by farming a crapload of Honor (5,250 Honor) and then converting it into Justice Points. You can also get it through the new Darkmoon Faire for 160 Darkmoon Prize Tickets. I do not have any information right now on how fast or how difficult it is to earn those tickets, so I can’t even estimate how long it might take you to farm 160 of them. Hopefully I can find a guide soon or experience it myself soon and can tell you then. The Tattered Dreadmist Mantle is just like the DHC above, except that it’s slightly less expensive. If you’re doing the Honor > JP conversion you need 3,375 Honor to purchase the JP for it. These shoulders can also be purchased with 110 Darkmoon Prize Tickets, though again I need more information on getting those before I can comment on how hard it is to farm them. The Tattered Dreadmist Robe is just like the Mantle above, with a cost of 2,175 JP (3.375 Honor) or 110 Darkmoon Prize Tickets. You could also consider the Mechbuilder’s Overalls as BiS if you’re looking for higher Intellect than Stamina. Both of these are strong contenders for the top caster chest, and which choice you go with is up to you based on your stat priority. I prefer to lean towards Stamina more than Int when I have two pieces that are this close, but that’s me. Spidersilk Boots trade 1 Int and 5 Crit for 3 Stam. Some people might consider that an upgrade, and others might not. Whether or not I made the change would depend on my class and spec. As a Mage, I’d keep the Acid Walkers. As a Warlock, I’d only keep Acid Walkers only if I were Destro. As a Priest, I would take the Spidersilks if I was healing, and I would consider Acid Walkers if I were Shadow though I’d probably get the Spidersilks instead. One thing you want to keep in mind as you gather your gear sets is something we’ve already addressed before – Hit Rating. The amount of Hit that you need in PvP is very small, and unless you’re really getting serious about twinking in 24’s I wouldn’t even bother trying to get hit capped for PvP, much less PvE. If you want to cap your Hit for PvP, then you need 4% which is roughly +12 Hit Rating. You can get that from enchants, gear, consumables, or a combination of those. If you still need to consider Hit Rating, then I’ll refer you to my previous post Hit Rating Off Sets.